We all know that if you go shopping when you know can't buy anything, you're almost guaranteed to see 42515,248,000 things that you really want. Now, sensible people would say 'okay, well I'll probably just not go to the shops then'. But not me - I go 'window' shopping, try things on, fall in love with them and then put myself through the emotional turmoil of putting it back on the hanger and handing it back. Why? I don't know. But that's how it's always been and today is no different. So here's everything that I really, really want just now. 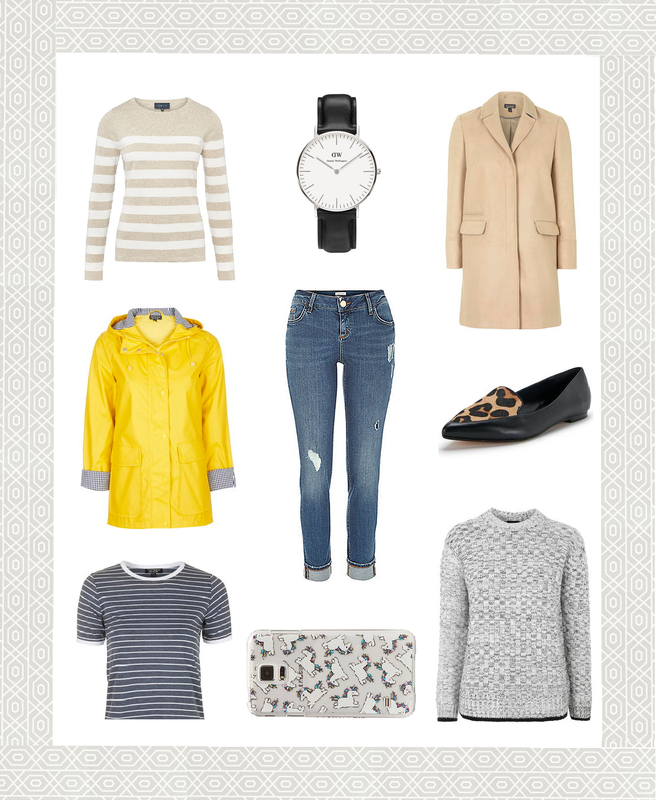 I've seen this yellow rain mac on a few bloggers lately, and in Topshop at the weekend (there was still loads in store, so don't be disappointed by the website!). I just love this colour and can see it going perfectly with my Autumn wardrobe. I'm going out for lots of walks and bike rides these days, so a rain mac is actually quite a practical idea - see how I justify things? I also tried this camel coat from Topshop, which is the front runner for my main A/W coat this year. The colour matches all the autumn colours and it's perfect for every day wear. I've included this Daniel Wellington watch because it's been on my mental wishlist for a long time now - I just love the simplicity of it. I was also super excited to find somewhere that stocks nice, fun cases for the Samsung s5 - does anyone else really struggle to find anything that's not just plain? The website I found is Skinny Dip London and although they've only got a few, I love all of their designs (..but the unicorn's my favourite!). What's on your wishlist just now? p.s make sure you enter my giveaway to win Fake Bake 5 Minute Mousse! 8 comments on "The Wednesday Wishlist. " Gorgeous list of items, love those leopard shoes! I bought a Daniel Wellington watch with my birthday money a few months ago and I've worn it nonstop! It really goes with everything. I love the shoes, too!